It’s something DEON VAN DER WALT has been contemplating recently, but when you think about it, cars are just an accumulation of raw materials. 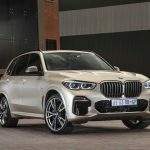 The only variating factor of how copper, rubber, steel and – in the case of the recently launched BMW X5 – premium leather has been used, is the level of expertise with which these materials have been fused together to create one uniform product that’s, quite simply put, on the cusp of perfection. This ‘level of expertise’, while open to interpretation, is also referred to as engineering. Or, if you favour a more progress-accurate description; research and development. Besides maintaining a sustainable sales strategy, it’s a carmaker’s second objective to push an envelope of possibilities with each new model it launches into the market. The new BMW X5 is one such model that moves the goal posts into another dimension. Sure, the available-as-standard functions like Cruise Control with braking function, Collision Warning and Park Distance Control are very nice-to-haves, but then again at a base price of R1,194,296 for the ‘entry-level’ xDrive 30d, it should be a given. Where the X5 sets the yardstick in its segment, though, is when you start to tick the boxes of the optional driving assistance department. One such instance is the Active Cruise Control that not only takes care of speed, but also performs braking and accelerating duties. It combines seamlessly into the Driving Assist Professional system that can take care of the business of both steering and lane keeping. Together, these systems – as well as an arsenal of other electronic assists and thingamabobs – drives the X5 semi-autonomously not only on a forward plane, but also, quite seamlessly, steers the X5 without any (temporary) driver involvement. 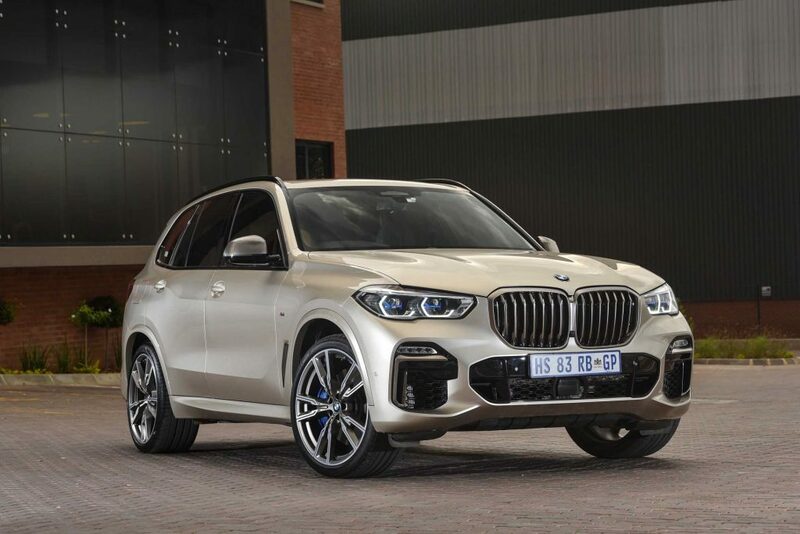 The new X5 not only features the newest styling embellishments that come in the form of a beefed-up BMW signature kidney grille and twin circular headlights, but in terms of actual size, subtle changes makes a considerable impact in the overall roominess of the cabin. 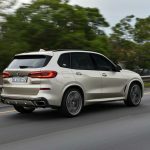 The wheelbase has been lengthened by 42 mm for better rear-passenger legroom, while the vehicle has seen an overall increase in its length of 36 mm. It is also 66 mm wider than the previous model, while it stands 19 mm taller. 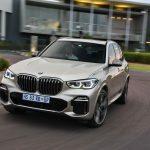 Despite the overall enlarged proportions of the X5, though, it looks more compact and agile than the previous generation X thanks to the larger grille that adds an imposing presence. On the inside, the Beemer feels commodious and exceptionally airy, thanks to the increase in exterior dimensions and BMW’s incorporation of horizontal lines into the cabin. 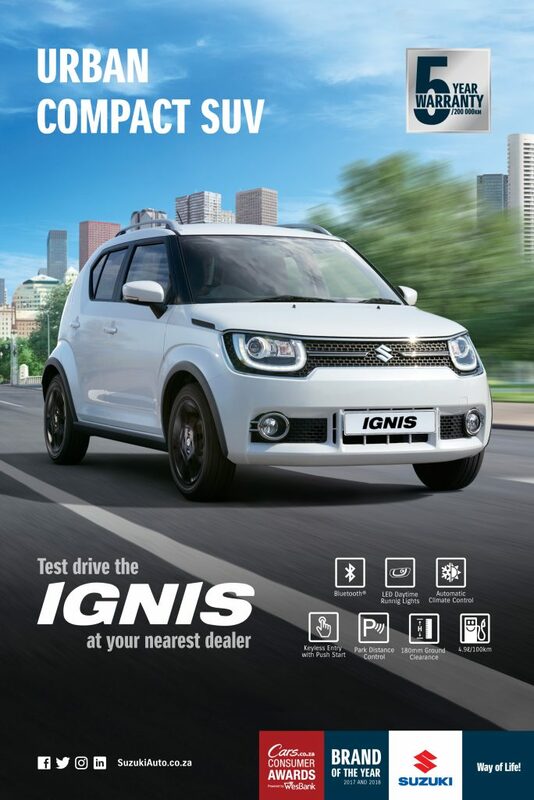 The interior is bang-up-to-date modern with the newest generation of connected technology that takes the centre stage. Chief amongst this tech is the BMW Live Cockpit Professional that encompasses the now familiar digital instrument cluster that measures in at 12.3”, while a similarly sized centre-infotainment system takes pride of place on the tastefully (irrespective of trim) dashboard. 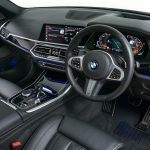 Both systems are operated using BMW’s 7.0 Operating System and during our test drives on the local launch, we found it intuitive and easy to navigate thanks to the ergonomic placement of different vehicle and media related pages. Other niceties like thermo-cup holders and massage seats can be ticked on the options list, while a Swarovski-crystal-looking glass-crafted gear selector, starter button and volume control switch can also be specified, just to make the X5 that much more bespoke. And let’s not forget about the panoramic glass roof’s Sky Lounge option that mimics the night sky using 15,000 miniature lights. 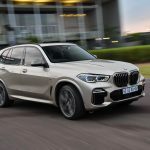 The BMW X5 is available in South Africa in two derivatives, namely the xDrive30d that comes in standard xLine guise, while there’s also an M Sport derivative on offer. It’s powered by a 3.0-litre in-line six-cylinder engine with a single turbo breathing apparatus, producing 195 kW and 620 Nm of torque that propels it from zero to 100 km/h in 6.5 seconds. 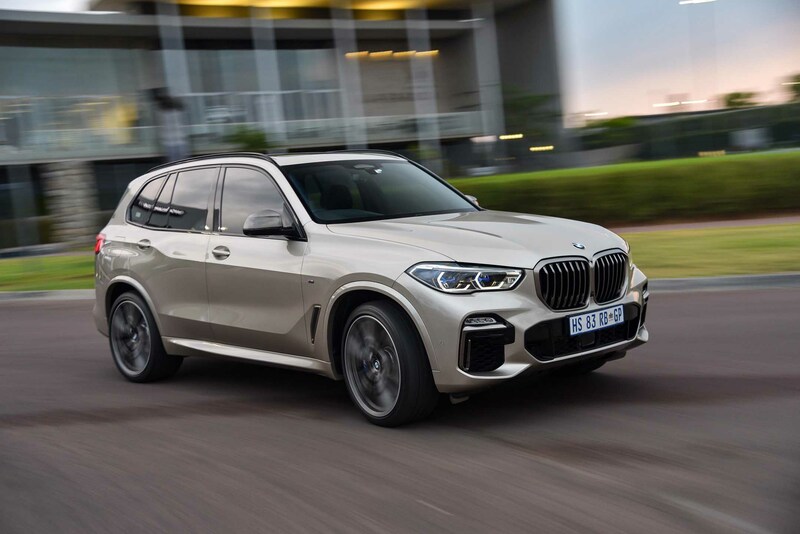 In the upper echelons of the X5 spectrum, resides an M Performance model dubbed the M50d with the similar 3.0-litre engine as its xDrive30d brethren. 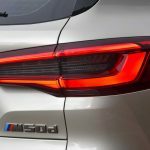 One important distinction, however, is how air is relayed to the engine and in this instance, BMW has made use of four turbochargers. It produces 294 kW and 760 Nm of torque, making it able to charge to the all-important benchmarking 100 km/h in just 5.2 seconds. From what I experienced piloting the M50d at the local launch, I won’t exactly call that a grand claim. In fact, it felt even brisker than what the figures suggest with a throaty exhaust note and the torque that is relentlessly sent to all wheels via the eight-speed Steptronic transmission. How about the xDrive30d then? Well, I can confidently say that it’s not lacking for anything in the performance department as it, too, feels sufficiently punchy with the press of the accelerator, but that is, however, not where it truly shines. Our test unit on the launch was equipped with the Off-Road Pack (that is now, for the first time, available in SA), together with an electronically controlled rear differential. Together with the General Grabber AT3 off-road tyres (available for R62,468 excluding VAT) from BMW dealerships, it became a kind of animal we have never experienced from the Bavarian carmaker. 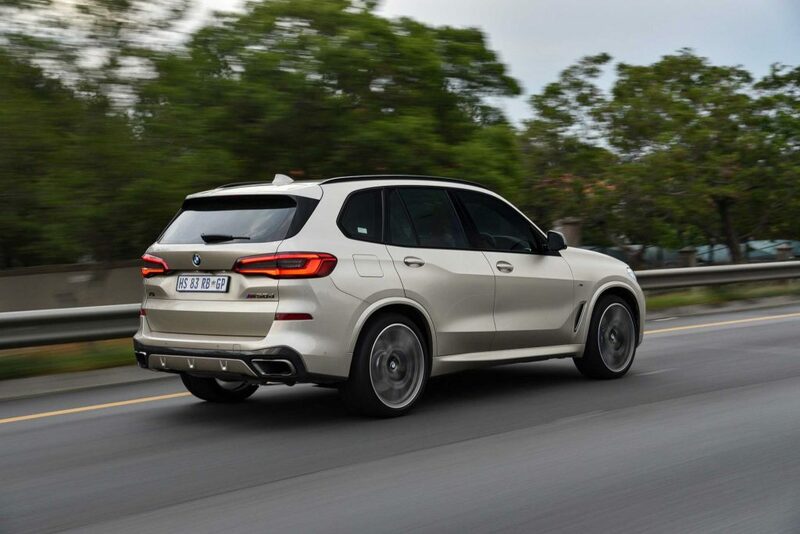 At nearly all reasonable speeds, the X5 ironed out any bump, corrugation or road irregularity during our extensive gravel trek as the xDrive system actively worked to stabilise the X5 during its off-road stint. What is, however, the icing on the mechanical brilliance that is the X5, is the uncanny level with which it involves the driver, even when it can, in theory, go about the driving business by itself. One such element that stood out on the launch route was the level of steering feedback. Through turns, on the straights or even on the gravel; the surface of the road was constantly projected via vibrations in my hands. All-in, the new X5 is, while being a grand leap onwards for the Bavarian carmaker, still an evolution forward. In this instance, all the raw materials have come together into a singular unit that feels lightyears ahead of what the competitors offer in the same luxury echelons. It’s an engineering and technological marvel and, driving it, you know it too. It’s clinical, precise and uncompromising. Qualities that, we’re sure, will appeal to many, but sheer driving pleasure? On a fundamental and analogue driving level, this level of engineering completely takes that out of the equation.